The MetalCloak JK 6Pak 1501 Front Long Travel Shockprovides the longest shock travel relative to a compressed length for any off-road shock ever built in history. Period. 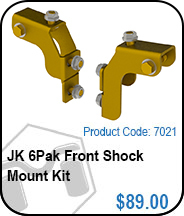 Compressed Size Eye to Eye: 13 1/4"
Extended Length Eye to Eye: 28 1/4"
Each shock is dyno-tested and rod ends are pre-set for easy installation. 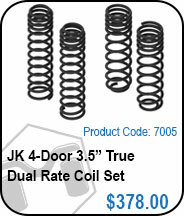 Shocks ship with the exact specs so you can be confident that your shock is ready for your vehicle. Shock application is only limited by your knowledge and application. Contact our suspension consultants for assistance on how the 6Pak can be part of your next build. Note: MetalCloak Recommends You Have a Suspension Specialist Align Your Truck Once MetalCloak Suspension is Installed. MetalCloak's Floating Shock Body Technology (FST) provides a game-changing platform featuring parallel shafts extending from a floating body, centralized by dual opposing reservoirs; this revolutionary feature allows for twice the usual stoke over typical industry shocks. Each 6Pak shock is hand built to exacting standards and then Dyno tested here at MetalCloak in Sacramento California. Our Next Generation of 6Paks - now with longer travel! 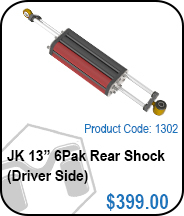 Designed specifically for applications where space is paramount; the 6Pak shock body extends shafts from both sides of a floating remote reservoir and allows for a much smaller compressed shock. Thanks to the tireless work of our engineers, we've figured out how to make the 6Pak shocks even better... More Travel! 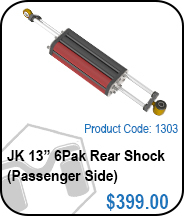 Our original 12" Travel shocks are now 13" Travel and our 14" Travel shocks are now 15" Travel shocks! 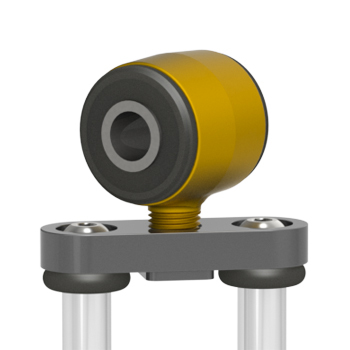 Our new fixed bushing is precisely positioned to ensure easy install. Just put the shock in position and bolt in. This eliminates the original method of having to bind the rod ends against each other just to keep it in place.